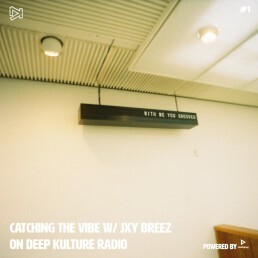 I’m very glad to introduce you to a new format for Catching The Vibe w/ Jxy Breez. From now on, every saturday between 5pm and 7pm CET, I will be sharing my weekly picks on my very own show, during a live mix that you can listen on dkmusic.fr ! Shout out to Damien for this opportunity and the team at Scandle for being so welcoming. This week, french rapper Tengo John caught my attention. His latest project, titled Hyakutake, has been buzzing around town so I had to listen to it. I wasn’t disappointed with the straight forward formula of nice raps coupled with very refined productions. Chicago rapper Saba is smoothly introducing the rest of his PIVOTGANG with the daedaePIVOT assisted “Papaya”. Odd Future alumni Domo Genesis, Earl Sweatshirt and Tyler, the Creator also make this selection. A lot of dope R&B cuts this week too. Santa Monica raised Leven Kali is staying consistent with his releases and “Thursday” is not an exception. I have a big crush on K-R&B star Hoody who joins Woo for an exquisite moment on “Phone”. Also, some jazz as usual with Yussef Dayes, Ill Considered, Kan Sano and Eli Keszler and new albums by beats vets Eric Lau and Steve Spacek. Click the cover artwork to listen to the playlist and If you are in your bathroom getting ready for the day, know that I feel you.